Who becomes an archaeologist? Good question. There are as many different answers as there are people doing archaeology. 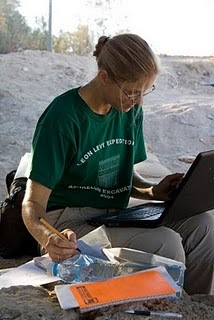 Today in our first "Getting to Know You" segment I'm going to introduce one member of our team of archaeologists. I was hoping to have the video working but since that hasn't happened yet I'm just posting a brief paragraph about Dr. Kate. Kate has a Ph.D. in archaeology from Harvard where she studied the pottery of the Sea Peoples on the coasts and inland in Anatolia & northern Syria (The Philistines are part of the larger phenomenon of the "Sea Peoples"). When in elementary school, she dreamed of becoming either a conductor or a donut maker. While she still daydreams of pastries, she is now the fearless leader of an entire area of excavation. In this area, she supervises the excavation of material from the Islamic through the Persian periods. During the excavation, Kate spends her mornings teaching the square supervisors how to be better excavators. In the afternoon, she "reads" pottery & teaches her supervisors & volunteers about the pottery that has been dug up during the morning. Coming soon the answer to the most recent "What? Where? When?" and the next installment of "Getting to Know You."